Growing up in Dublin, Ireland, Austin Dwyer developed a passion for the beauty of the land and the rugged sea that surrounded him. As an adult his travels brought him to the United States where he joined the USAF. After being discharged in 1961, he arrived in Seattle a proud American Citizen. Dwyer graduated from the Burnley School of Professional Art in Seattle and taught Illustration and Design there for fourteen years. He then co-founded the Cohen-Dwyer Advertising and Marketing Agency, retiring in 2005 to devote himself to painting full time. Working as an artist, designer, writer and inventor, Austin has always pursued his “obsession with painting”, describing it with a passionate resolve that cannot be denied. 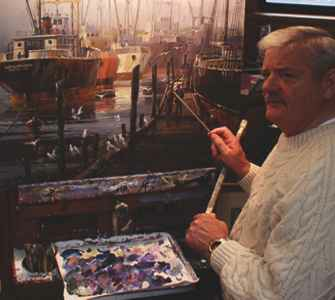 He has become renowned as one of America’s top marine painters of historical ships and seascapes. Beyond the Northwest where he lives, he is widely acclaimed in Mystic Seaport, Connecticut, (America’s marine art Mecca) and is also collected internationally. Austin Dwyer is a Fellow and past president of the Puget Sound Group of NW Painters and a member of the Modern Marine Masters association. He is also a signature member of the American Society of Marine Artists and member of the Board of Directors. Austin continues his passion, painting the sea, ships and his beloved Ireland.